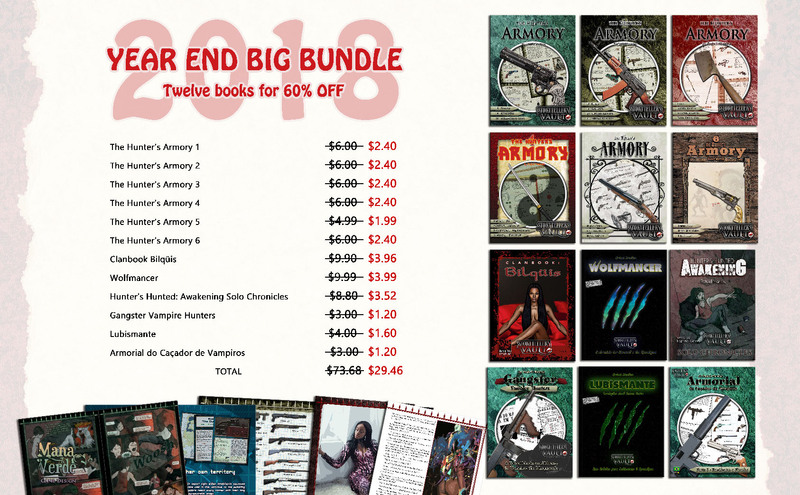 This offer includes 12 complete books from Mana Verde Game Design. All of these books are part of the Year-End Big Bundle and are included in the package with a 60% discount. They are Twelve books with more than 400 pages of content for a unique and must-have price! The Hunter's Armory Collection is undoubtedly my most successful series. The first two volumes have sold more than 100 copies each. It brings a collection of weapons of different eras and styles, ready to be used in your chronicles. The books are well organized, containing a block of statistics and pictures for easy viewing for Players and Storytellers. The statistics block contains relevant data to aid in the description of the equipment such as size, approximate weight, Resources needed and other information that may be useful to further enrich your narratives. The weapons presented in the collection contain all the statistics necessary to be used in any supplement and any edition already published by White Wolf, as well as optional rules to be used at Storyteller's discretion. In addition, extra information and curiosities are presented throughout the work, accompanied by colorful illustrations and diagrams. Hunter's Hunted - the Awakening Solo Chronicles is by far my most ambitious project. Inspired by the classic Fighting Fantasy adventures that took my imagination through my childhood, I decided to create a series set in the World of Darkness where you are not only the protagonist but all the main characters. During the chronicle, which will have many different endings, you can take on the role of different characters, who will change, evolve or perish according to your choices. The work, planned for 10 chapters, counts on the illustration of the Brazilian artist Raphael Gomes and already has two finished chapters, and two more are scheduled to be released next year. By acquiring the book you will be entitled to all future updates, without having to spend any more money. By the way, this is my guarantee to you, dear readers: All my products are constantly reviewed and updated periodically to ensure that you will always receive quality content. Wolfmancer is a crossover chronic between Vampire: The Masquerade and Werewolf: The Apocalypse, inspired by Willian Gibson's classic book and historical landmark of cyberpunk literature "Neuromancer." Here I take the boldness of borrowing consecrated elements from Gibson's narrative and mixing it with Lewis Carrol's surrealistic spice in Alice in Wonderland, creating a scenario divided between the Wirm's polluted streets of the São Paulo Megalopolis and the Weavern's silicon webs of Spyder City, in the Cyber Realm. The story is presented in the Storytelling Adventure System format, and the material has been carefully interlinked by links and buttons that help the Storyteller to conduct the story with ease and dynamic organization. Scenarios, NPCs statistics and new equipment are always presented in an organized and easy way.